RESTON, VA, July 21, 2014 – Comscore, Inc. (NASDAQ: SCOR), a leader in measuring the digital world, today released data from the Comscore Video Metrix® service showing that 186.9 million Americans watched online content videos in June 2014. Google Sites ranked as the top video content property, BrightRoll Platform was the top video ad property, and VEVO topped the list of YouTube partner channels. 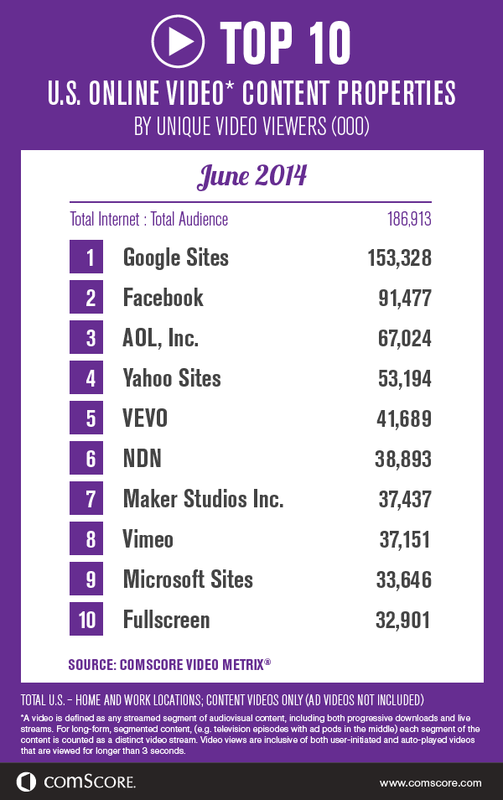 Google Sites, driven primarily by video viewing at YouTube.com, ranked as the top online video content property in June with 153.3 million unique viewers. Facebook ranked #2 with 91.5 million viewers, followed by AOL, Inc. with 67 million, Yahoo Sites with 53.2 million and VEVO with 41.7 million. BrightRoll Platform ranked #1 in video ad reach, serving ads to 49.8 percent of the total U.S. population in June. Specific Media came in second with 40.8 percent reach, followed by AOL, Inc. with 36.7 percent, LiveRail with 35.6 percent and Google Sites with 34.4 percent. The June 2014 YouTube partner data revealed that video music channel VEVO maintained the top position in the ranking with 41.1 million viewers. Maker Studios Inc. held onto the #2 spot with 36.8 million unique viewers, followed by Fullscreen with 32.9 million, Warner Music with 24.4 million and warnerbros vfp with 23.1 million.